Champion is the largest shuffleboard manufacturer in the U.S., and their shuffleboard tables are highly prized by professional players worldwide for their exquisite beauty, uncompromising quality and customizable features. Standard features of these Championship Line of shuffleboard tables include a red oak veneer cabinet and a solid Canadian maple playfield with polymer finish that does not require resurfacing. 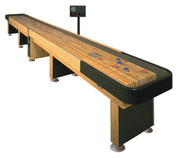 Also standard on all Champion tables, the company's patented Handicap Scoring allows for a faster paced game. It's especially useful when an experienced player is playing with a novice. With the handicap scoring method, the experienced player uses traditional scoring while the novice player uses the handicapped scoring. This levels the field and results in a more challenging, faster paced game. A fast, exciting game benefits the players in terms of enjoyment. In the case of a commercial establishment with a coin-operated shuffleboard game, it benefits the owner as well, since more games in a shorter span of time amounts to more money. These distinctive shuffleboard tables include climatic adjusters to allow for variations in temperature and humidity, for perfect alignment and an ideal playing surface. Table sizes range from lengths of 12 feet with 3 legs and 4 climatic adjusters to 22 feet with 5 legs and 8 climatic adjusters. Options and upgrades include a selection of scoreboards, 2-piece playfield and a Champion light kit. For shuffleboard games in a commercial establishment, there is an option for coin operated play and their Pingate System which prevents free play. You can also select from several stain colors and add your company's full color logo to the table. A set of 8 pucks and wax are included is included with all tables. The Shuffleboard Federation includes free shipping for curbside delivery, or you can choose their expert inside delivery and installation.